Warning: Removing the cover too many times can result in it no longer fitting tightly to the knife. My cover fell off one day and I lost my battery and battery compartment door. It’s probably a good idea to use a bit of glue to make sure the cover stays when you put it back on. The Victorinox Midnite Minichamp is a damn useful Swiss Army knife. It’s cut and picker blade is very useful for stripping wires when a proper wire stripper isn’t available. It also has a retractable pen and an LED light. The newer ones use a white LED, but I bought mine many years ago, before low cost white LEDs became available, so it has a weaker red LED. A red light can be beneficial if you want to preserve your night vision while reading constellation maps when stargazing. However, that is a very specific purpose and there have been many times I could have used a brighter light. Therefore, I’ve wanted to replace the Minichamp’s red LED for a long while, but it wasn’t until I saw Swiss Army knives being assembled on an episode of Modern Marvels that I finally gave it a go; it turned out to be a piece of cake. The Minichamp’s CR1025 battery is removable by poking a toothpick into a small hole in the knife’s plastic cover. The toothpick pushes the battery and tiny plastic door out the opposite side. 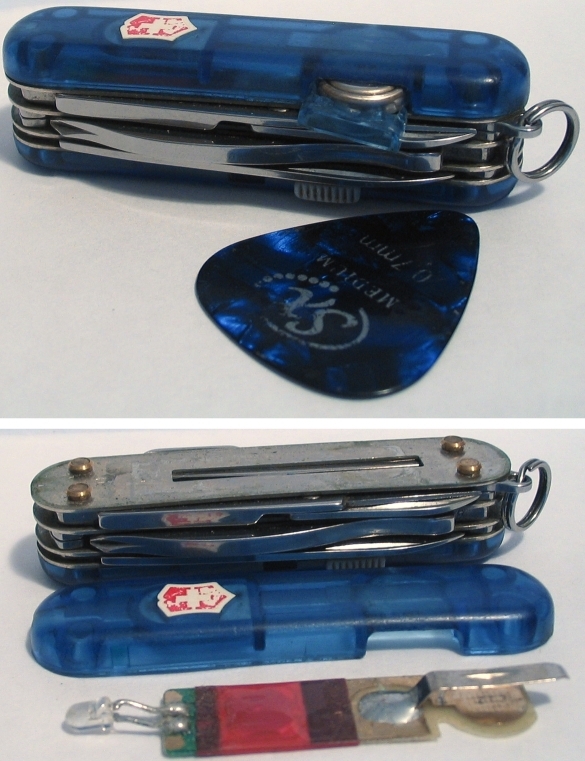 With the battery removed I was able to wedge a guitar pick between the plastic cover and the body of the knife. Then I removed the plastic cover by gently prying around its perimeter. I didn’t have to break any glue bonds or plastic tabs; it was just a simple friction fit. The LED assembly consists of a battery holder, a momentary switch, and a 3 mm LED soldered to the assembly’s substrate. I desoldered the red LED with a little solder wick, cut the white LED’s leads to the same length as the red LED, checked I had the correct polarity, and then soldered the new LED to the board. The width of the white LED was larger than the red one and prevented the plastic cover from properly fitting back onto the knife. To fix this I used the Minichamp’s file to remove plastic from the LED until it was flush with its housing. The LED assembly and cover should be refitted onto the knife so that the LED and retractable pen point in the same direction, so you can see what you’re writing in the dark. Finally, I shouted “Lumos” (*cough* Dork!) and pressed the button. Presto! Nice, bright, white light. I was thinking about how I could use an RGB LED and a switch with more than one throw to get red and white light, when I remembered there is such a thing as bi-color LEDs that only use one anode and one cathode. This type of LED has two dies in anti-parallel in one package. Therefore, if this type of bi-color red and white LED is used in the Midnite Minichamp all the user has to do is take out the battery and flip it over to switch from red light to white light; no other changes to the circuit are necessary. I found a place online that sold red/white LEDs for a reasonable price, so I bought a pack. Unfortunately, I didn’t like the brightness of the white die in the bi-color LED so I’m sticking with the regular white LED I already have in the knife. Still, I thought this was an elegant solution and I’m posting it here in case anyone else thinks having both red and white light is worth the trade off. led-switch.com — This was the only place I could find two lead, bi-color red/white LEDs. Only $2.95 for shipping! This switch might be able to fit inside the knife with a little bit whittling down. Great article (nice knife)! I’ve used the red and white LED’s. I wish there would be brighter Red LED or both lights in one little knife. In most cases white is more preferable since it’s much brighter and I need a light when my night vision is not working yet. Red light is great if you using dark room or piloting a plane or need a light when your night vision already kicked in and you dont want to spoil it. I had the same thoughts about the red versus white LED, but I finally decided that the brighter white light was better for the me. I have an LED headlamp that has red LEDs for the times I need to preserve my night vision. It might be possible to replace the LED with an RGB LED and use a small microcontroller to pick red, green, blue, white, or off based on the number of button presses. Or perhaps there are bi-color LEDs that are just red or white. I’d also like to be able to choose which blades were in my knife, although the midnite minichamp is almost perfect for me already. Using the pen to pop up the battery is a good idea. Thanks. I don’t think the LED has a regulator in it. The voltage drop of the LED is close to 3V already and the internal resistance of the CR1025 helps regulate the current.. Someday I might buy an onyx minichamp; if I do I’ll compare it’s output to this one. However, LEDs are improving all the time so it’s probably worthwhile to replace the factory LED with a new one after a few years even if its already white. Hey, thanks! I’ve always wanted to replace this with a white LED but thought maybe the plastic cover once assembled by Victorinox was pretty much permanent. The knife was sitting on my desk and I thought, what the heck, I can’t be the first one to want to swap it and Googled it and found your post. I used a guitar pick as suggested and worked fine. Cheers! Thanks for posting this! Needed to clean and lubricate mine, but was worried about getting CLP in the electronics. No worries now, directions are great. Do you have any numbers for the LED, I have bought two different batches of them and they don’t work (light up)? Also where did you get the LED? That’s strange. Any generic LED should work. Are you sure you connected the LEDs correctly. They are polarized so you have to connect the anode to the positive and the cathode to the negative. Did you try testing the LEDs properly with a higher voltage battery and a current limiting resistor? Perhaps your battery’s life is almost up or your knife is different somehow. I bought from this guy, but it was so long ago there is no telling if the ones he has now are the same as the ones I got. Is there somebody who can tell us what type and specifications of LED is more likely or exactly the one Victorinox is using? I know that it is 3mm, but which MCD, voltages (min-max) and which light stray angle? Is it a white or water clear one? That’s cool. I hadn’t thought of adding a microcontroller. I might have to do something similar. Very nice infos from you all. Jet warning (up there on the start) about loose scale happened to me. I used a drop of mild plane modelling glue and it holds. I also get a 4.5 DC Volts (3xAA) batteries soldering iron on my last visit to Walmart because using a gas and electric soldering irons are not that swallow when it comes to heat. My next project now is to visit another shop who is selling those “still-red” LED gadgets for almost only 1/3 of the normal price. I will get a dozen of those and will upgrade them to white LEDs and make them as Christmas presents. Oh well, I like this! What type of white LED light did you use? Whitewater, I think these names are correct. My question is what type of white LED light did you used to get the same bright whiteness of a Victorinox SAK knife ? Pick an LED with a brightness and beam angle that you think will work best for you. Pure is probably better than diffuse for use in a flashlight. All it really has to do is put out light. It’s hard to mess up.